Rhino's reissue of Fleetwood Mac's first foray out of blues and towards the pop/rock sound that we know and love them for. After reissuing Rumours earlier this year, Rhino decided to turn its sights on lesser-known Fleetwood Mac albums (or, in sadder but truer words, any Fleetwood Mac album not named Rumours). The eponymous album that preceded Rumours, and Tusk, the sprawling double album that followed it, seem like more logical choices than Then Play On, an album that barely sounds like Fleetwood Mac to the people who are only familiar with them through radio play. (Despite the fact that single “Oh Well” hit #2 on the UK charts, across the Atlantic, it’s more known under its other name, Led Zeppelin’s “Black Dog”.) But if you put it into perspective, it’s not hard to wonder why this one is receiving extra consideration: it’s the band’s first album that doesn’t sound like the work of a(nother) British blues band (this is the first to not feature any blues covers), and it does have “Oh Well” on it. The real question is: does it deserve the consideration? The answer is yes and no. There are good parts, certainly, but they’re buried under Danny Kirwan’s folk numbers that mistake softness for emotion and competent instrumentals that never strive to be more than that. The band devotes nearly ten minutes to Madge, but can't be bothered to answer questions like who she is and why we should care (it was later revealed that Madge was a female fan of the band). Thankfully, Peter Green, either threatened by newcomer Danny Kirwan or because he knew that he was going to dive into acid and leave the band right after Then Play On, hands in the band’s strongest numbers at this point in time. “Rattlesnake Shake” is typical of rock music from the late 60s -- psychedelic sounds (see the 1:24 mark) and bawdy innuendo (I’m sure you can guess what the song is about based on the title) on a blues rock template -- but because Peter Green hasn’t attempted either of those things before, it’s an easy album standout. It flopped as a single, but that only spurred the band to make “Oh Well” as another single. The first part races by, thanks to the howling electric guitar and the dynamic shifts whenever Green takes vocal point. The second part (its own track now, thanks to the Rhino issue) is linked only by key, a six-minute reflection that starts solemnly and builds towards optimism. Because both parts sound completely different, it’s the fact that the band manages to make them sound like a cohesive whole that’s the most stunning part about the track; no surprise that it was a live staple even following complete lineup changes and is one of the few pre-SoCal Fleetwood Mac tracks to find its way onto their best of compilations. Peter Green is obviously more known for his guitar work than his lyricism, but his lyrics on Then Play On are surprisingly good. On “Oh Well", in less than six lines (eight, since two are repeated), he manages to touch on self-deprecation (“I can’t sing, I ain’t pretty, and my legs are thin”), ambiguous romance, and mortality (“But [God], don’t ask me what I think of you / I might not give the answer that you want me to”). He’s proud to let his lyrics show too; the electric guitar ascends to a piercing high before completely dying down for his vocals. “Show-Biz Blues” tries for the same method for the repeated “Do you really give a damn about me,” but it delivers far less rewards. Following the aforementioned standouts, Danny Kirwan comes in with the next best track. Opener “Coming Your Way” throws you into the jungle thanks to Mick Fleetwood’s Latin drumming, but it’s a shame the band decided to end it with an overly normal and overly dramatic guitar reading. Unfortunately, none of Kirwan’s other contributions are noteworthy. “When You Say” devotes most of its energy to “La-la-la”’s, which would be fine if it had a melody to back it up; “Without You” has Kirwan attempting the blues, but he’s not built for it; “Although the Sun is Shining” is a soft rock track, a glimpse of things to come, but Kirwan’s timid vocals prevent anything from sticking (don’t worry, that’ll change in a year’s time with Kiln House). Thankfully, on the other side of things, Peter Green’s “Before the Beginning” ends the album (the original release, anyway) on a solid note; the single repeated guitar chord during the chorus sounds particularly striking, while Mick Fleetwood’s drums sound like they’re coming from down the hallway of an abandoned mansion. 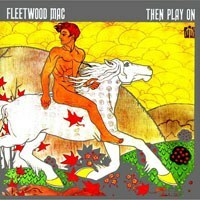 Unlike Rhino’s reissue of Rumours, the reissue of Then Play On doesn’t come with as many tracks as they could find from the era. What it does do, however, is restore the tracklisting to the original issue. Following “Oh Well”’s success, there was a hastily thrown together U.S. issue, dropping four of Kirwan’s tracks either because they had appeared on the U.S.-only compilation English Rose or to make room for the gargantuan track. However, I’d argue that despite all of the cut tracks being weak, they add dimensions to Then Play On that were lacking on previous Fleetwood Mac albums. Not only that, however, but because of the way “Oh Well” worked on its single release, there was a repeated minute. Rhino’s reissue is the first time that that issue has been fixed, and that’s a warm welcome for people who don’t want to hunt down a compilation for the sole purposes of owning a flawless version of “Oh Well”. It also comes with two bonus tracks, neither of which are essential listening.